Super Chef was inspired by Judith Fertig‘s Heartland (see Judith Fertig: The Heartland) to find out more about author Willa Cather and her passion for good cooking. Luckily, a reader guided us to editor Ann Romines‘s At Willa Cather’s Tables: The Cather Foundation Cookbook (Allen Press 2010). The cookbook brings together recipes from Cather’s novels, as well as her family and friends, places she lived, and the Foundation itself. It is full of wonderful illustrations from her books and her objects. In her mind, it seems, cooking and writing were both creative, artistic activities. For Cather fans and soon-to-be Cather fans, At Willa Cather’s Table is a wonderful gift. The images of menus, coffee grinders and cheese graters, and the houses where Cather lived add to pleasure of reading the book. Ethan Frome was written by Edith Wharton, so I am confused by it’s inclusion in a book about Willa Cather. Is there a connection there, aside from Wharton and Cather’s authorial status? 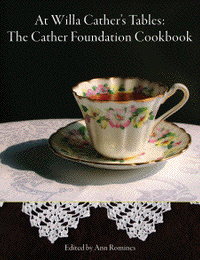 This delicious cookbook is available online at the Willa Cather Foundation’s website http://www.willacather.org. Better yet, come buy one in person at the annual 56th Annual Willa Cather Spring Conference to be held April 29-30, 2011 in Red Cloud, Nebraska.